(March 17): The Taiwan dollar, South Korean won, and Indian rupee are on target on Friday to set their biggest weekly gains for many months, bolstered by a greenback weakened by the US Federal Reserve's decision earlier in the week. The Taiwan dollar was up around 1.4% for the week, set to post its biggest weekly gain in more than five years, while the South Korean won was up more than 2% for the week, set for its biggest weekly gain in eight months. The Indian rupee, which got a boost from the state election results, is set to register a weekly gain of 1.5%, the biggest in a year. However on a daily basis, Asian currencies were slightly weaker on Friday, weighed down by rises in US Treasury yields in the last two session. The 10-year US Treasury yield stood at 2.5332% on Friday, having edged up from Thursday's low of 2.4860%. Analysts said rising US yields were likely to put pressure on Asian countries to tighten their monetary policies, signalling an end of a long cycle of monetary stimulus across Asia. On Thursday, China raised short-term interest rates for the third time in as many months, while Indonesia kept its benchmark interest rate unchanged for the fifth straight meeting. Indonesia had cut its rates six times last year in an effort to boost its economy. The window for more monetary easing in South Korea looked to have closed after the Federal Reserve's rate rise, despite struggles with household debt, economists said. 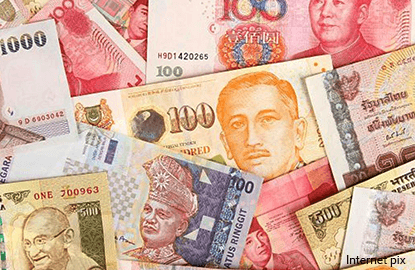 "In terms of monetary policy, Asia is likely to remain pretty neutral for now," said Nizam Idris, head of strategy, fixed income and currencies at Macquarie Bank. Investor attention will move to political risks with the start of the G20 meeting of finance ministers and central bank presidents on Friday, analysts said. The protectionist stance of US President Donald Trump's administration could complicate the talks, they added. "The focus is on the US request for changes in global trade agreements ... They may want to renegotiate bilateral or multilateral trade agreements, which may read as potentially negative for emerging markets," Nizam said.